It takes at least three years to grow a crop of sheep sorrel roots for medicinal purposes. Young roots initially have little to no potency or flavor. They have a light yellow color and and are very fragile. In the third year the roots are larger, bitter, tougher and they are a darker, golden color. This is when they are most potent and have the highest therapeutic or "medicinal" value. They should then be harvested after the first frosts before the ground freezes when the tops have died down or before spring growth in late winter immediately after the ground thaws. We have been growing our own sheep sorrel for several years and we no longer use wildcrafted sheep sorrel roots. The problem with wildcrafting sheep sorrel is that you never know with any certainty if herbicides or pesticides have been sprayed at some time in the past because many herbicides do not kill grasses or sheep sorrel, which grows like grass. One can observe miles of roadsides and freeway medians that only have sheep sorrel growing because only broad-leafed plants have been targeted for elimination. However, the poisons--often cancer-causing--are still in the ground. And the natural chemistry of the soil has been altered. Also, it is not known whether there are any mineral deficiencies in the soil when wildcrafting. 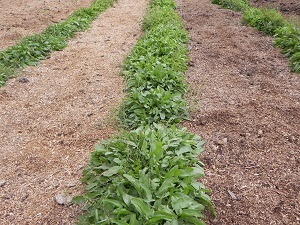 We have therefore been growing our sheep sorrel on mineral-rich soil that has never been farmed in the Sandpoint, Idaho area. Sheep sorrel--a mineral loving plant--thrives in well-drained soil that is composed of sand and gravel. Our soil here in north Idaho is a result of thousands of years of glacial erosion and flooding from Lake Missoula that contains all the minerals from the surrounding mountains in the form of sand, gravel and rock flour. 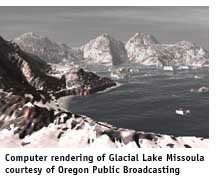 Of course, Glacial Lake Missoula no longer exists due to the climate warming over the past ten thousand years. Lake Missoula was formed by the mountains in the north Idaho and northwestern Montana area and it covered 3000 square miles! Beach sand--over 4000 feet above sea level--can be found near the mountain tops surrounding Sandpoint, Idaho as well as the valleys below. A glacial dam over 2000 feet high formed at the southern most tip of what is now Lake Pend Oreille near Sandpoint. This glacial dam would suddenly break and release catastrophic floods of water, ice, sand, gravel, silt and car-size boulders that carved the landscape all the way to the Pacific ocean. 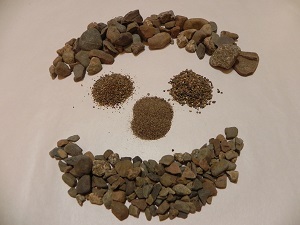 The picture on the right shows the various sizes of these multi-colored pebbles, sand and silt from our sheep sorrel growing area. Granite and basalt are very prevalent in the soil and organic farmers and gardeners sometimes apply these rock powders to the soil to supply the necessary minerals to grow vibrant crops. It was not necessary for us to do so because our soil is already chock-full of minerals and we made sure that there was a correct balance of minerals via soil testing. Also, the volcanic Cascade mountain range has deposited minerals in our area as we more recently observed in the 1980 eruption of Mount St. Helens. An enormous cloud of ash blanketed our area and replenished the top soil with a fresh batch of minerals from deep within the earth. In addition to all the minerals already present in our soil we add certified organic humic shale which contains about 75 different plant-based, colloidal minerals. 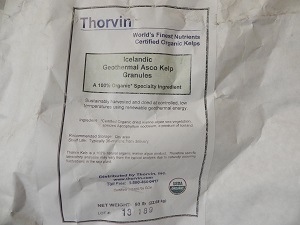 We also add certified organic kelp which is harvested from the pristine, mineral rich fjords of Iceland. This adds iodine and other sea-based minerals that may not be present in sufficient quantities in land-based farming. The picture at the top of the page shows how we have mulched the soil with local fir wood chips for organic material that encourages beneficial fungi, (e.g. 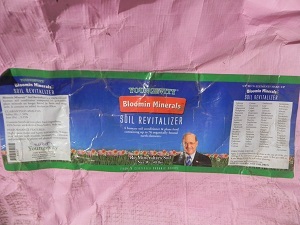 mycorrhizal fungi) that help plant roots absorb the minerals. The mulch also helps preserve moisture in the soil and provides an environment that encourages earthworms and other friendly soil life forms to thrive. Modern farming methods do not replenish minerals or mycorrhizal fungi in the soil which are so important to the health of plants and the people who eat them. Without minerals plants cannot make vitamins and other life-giving substances. Dr. Gabriel Cousens, M.D. recommends two of the components of Essiac tea, sheep sorrel and slippery elm, as an essential part of his raw food diet in his book RAINBOW GREEN LIVE-FOOD CUISINE. He stated that sheep sorrel is one of the "high-colloidal foods that are rich in the super-colloid minerals iridium, rhodium and gold". Of course, if the soils are deficient in these and other health-giving minerals they will not be present in the plants that are eaten. Dr. Cousens has demonstrated in his "Simply Raw" documentary that diabetes, for example, can be cured in thirty days with raw, organic, plant-based food. Modern farming practices and in some cases even organic farming methods do not replenish the minerals in the soils. There is no requirement by the federal organic standards to provide all minerals in the soil necessary for optimum health. In fact, farms with mineral-depleted soils that have been sprayed with toxic agri-chemicals for generations can be organically certified after only three years of not applying cancer-causing herbicides and pesticides! That is why we only grow our sheep sorrel on soil that has never been farmed. Therefore, we believe our sheep sorrel is superior to the government-dictated organic standards. And that is why we have for years referred to our Essiac tea herbs as "Better Than Organic". We have watered our sheep sorrel with natural, mineral-rich water from a deep well that does not contain any additives such as chlorine or fluoride or other toxic substances. It doesn't get any better than this. Click here to learn more about how we harvest our sheep sorrel roots. Click here to read about our Essiac Herb Quality.